More on that monstrosity in a few days. While trying to decide what to do with some of our surplus, I remembered a post by the lovely Kristen of Dine and Dish. She recently started an initiative called Clicks 4 a Cause, where she's donating all the proceeds for the rest of the year from ads on her blog to her dear friend Ann's cancer treatment, and she's encouraging other bloggers to do the same for any cause they're passionate about. 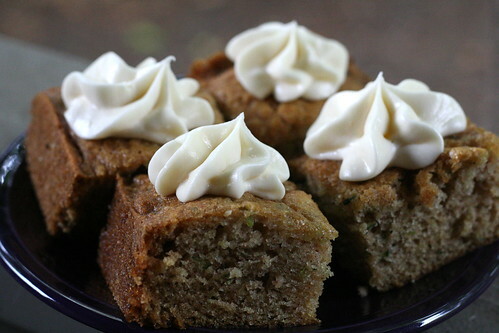 Kristen's moving post about Ann and Clicks 4 a Cause also included a recipe for Zucchini Bars with Cream Cheese Frosting. I'm not going to share the recipe or my minor adaptations to it, because I'd like to ask that you visit Kristen's blog instead. If even one of you clicks over to Dine and Dish (you don't even have to click on an ad, just visiting her blog helps! ), we will be doing a small part together for this generous undertaking. This is just another example of why I love the blogging world: so much love for strangers floating around out there! I will say that these bars were a huge hit with both Andy's and my coworkers. And Andy, who hates zucchini, was giddy with excitement when he came home at the end of the day and saw that I had saved him an extra one. I highly recommend this if you're looking for a crowd pleaser. And again, for Kristen's Zucchini Bars with Cream Cheese Frosting recipe, click here! You are so kind, Amy. Thank you so much for the Clicks 4 a Cause mention. I truly appreciate it! Oh - and those bars look beautiful! I love how you did the frosting! I am not a big frosting fan so I love the little dab! too cute! Amy, these look really, really good. I'm not a huge sweet lover so I love the way you've frosted your bars. I hope you are having a wonderful day. 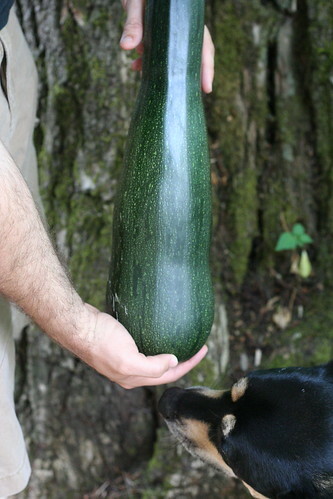 That is one huge zucchini!!! I love certain frostings and just in the right amounts, not too much but just enough to add that special touch. These look so good!